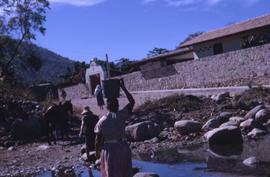 Colour Kodachrome 35mm slide depicts a woman walking with a metal pail on her head and two other women and a horse in the background. 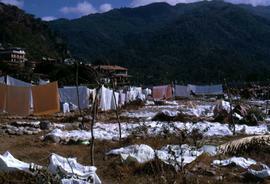 Colour Kodachrome 35mm slide depicts laundry hanging to dry on lines and laid out on the grass. Colour Kodachrome 35mm slide depicts an unknown man sitting on a chair outside of a thatched roof hut. There is a red motorcycle on the road.